There is nothing like getting dirty and finding things in nature. Children learn when they see, do, touch, and experience. To be a green mom, I have to let my kids just get dirty. They have to dig for worms, feel the soil, sometimes taste it and figure out what those worms are doing. It means scrubbing finger nails and taking long baths to soak but it helps the children understand for themselves what a worm is, how nature works and exactly what it feels like to figure something out. From all of my children’s exploring they have figured out, without me teaching them, that worms like dark, moist places to live. They know where the slugs are and which rocks to turn over. I did not teach them any of this but through exploration they have learned. This has also taught my children empathy. They realize that worms are used for fishing or that birds eat them and they handle them gently. They want to know what worms eat and this led us to the discussion of composting and how soil breaks down. I found a neat power point presentation that helped teach my son about composting and then we took a trip to the library. He has now started asking us if we can make a compost bin and what are some ways that we can compost at home. One thing has led to another and now I am learning more about composting so maybe as a family we can begin using a compost bin or building one of our own. I’ve discovered a few helpful books: Compost By Gosh by Michelle Portman and Worms Eat My Garbage by Mary Appelhof. These books are for me to figure out what I’m doing but my son has been looking at Wiggling Worms at Work by Wendy Pfeffer and the book A Handful of Dirt. We have a lot to learn but together we are discovering how to be more earth friendly. We can start big and make our own as the power point show us or we can just start with a small kitchen composting bin and work up from there. Either way, it is fun to learn about. Something as simple as digging for worms one day has ended in book buying and library trips to learn more! To be a green mom and raise your kids green you don’t have to just care about BPA Free Sippy cups or organic food. 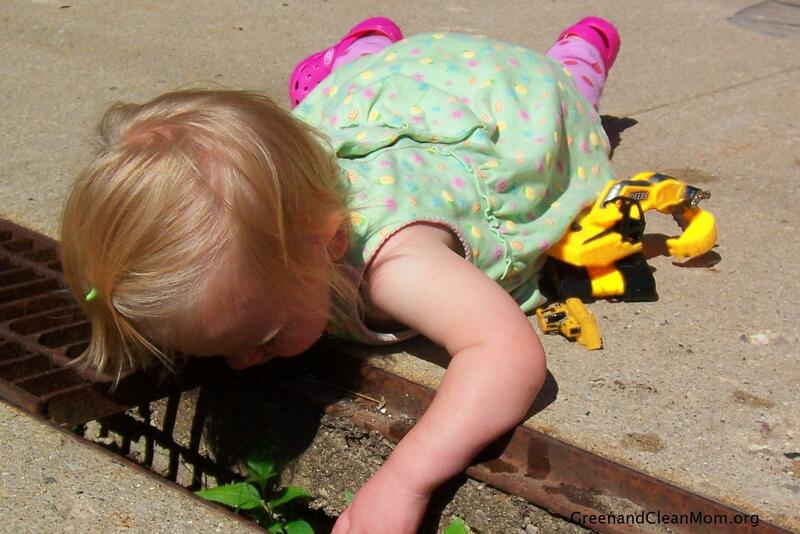 There are lots of ways to be an eco-mom and help your children learn about the environment! My advise, get dirty and go from there! Previous articleGetting My Cloth On! …and sometimes it means just living with dirty fingernails. It’s just dirt, right?! Composting is super fun to do with kids. We just got our first batch of finished compost (woo hoo!) and got to plant seeds in it for fall crops. That pretty much rocked. And it has made my 5 yo think so much more consciously about trash and garbage that doesn’t compost. Now she wants to know where it goes…. Royte? Children’s books plz? Thanks for the book recs. I want to check into vermiculture so have been hankering to read the worms one. MamaBird/SurelyYouNests last blog post..Mom, Watch Me! Sommer, I would love to see this post on my website. I think it is a great way to show that the outdoors can be just around the corner even in the city. Okie dokie, I may be the next one with compost pictures (heaven help me). It’s my last leap, and for some reason I find it terrifying. My son loves playing with worms, but the whole idea of composting just seems too much like work to him. But my 5 year old daughter loves about anything to do with the garden, especially harvesting.